White, or 'Wish-granting Gem', Mahakala is a wealth aspect of this 'great black' (mahakala) wrathful protective deity, who is white in complexion with six arms. He stands upright upon a golden sun disc and a lotus, and with his two feet he tramples upon an elephant-headed male and female Ganapati, who each hold a white radish and a mongoose in their two hands. His curling yellow hair streams upward, his three red eyes are round and bulging, and his gaping mouth reveals his four sharp canine teeth and twisting tongue. He wears many ornaments of gold and bone, a five-skull crown, a long billowing silk scarf, a tiger-skin loincloth, an elephant-skin shawl, and a garland of fifty severed heads. 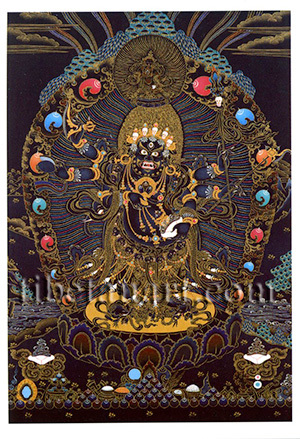 Mahakala's back is supported by a sandalwood tree, the upper canopy of which can be seen above the radiant arc of fiery jewels that surrounds his inner aura: And encircled within the sphere of radiant light above Mahakala's head is a sambhogakaya form of Ratnasambhava, who holds an eight-faceted gem and a bell in his right and left hands. At the bottom of the painting is a row of jewels with a stacked pyramid of jewels at its centre, with the eight auspicious substances, the five sense offerings, the chakravartin's seven emblems, and two nectar-filled skull-cups appearing behind.